In the 1970s and 1980s, it was typical for architects in Australia and worldwide to consider Italy at the forefront of international trends…Italy held a high status in Australia at a crucial point of step-change in the process of internationalisation. Relationships with Italy were crucial in contributing to the making of postmodern architecture in Australia. In this collection of essays and conversations, the authors reflect upon the reception of Italian postmodern architecture in Australia. 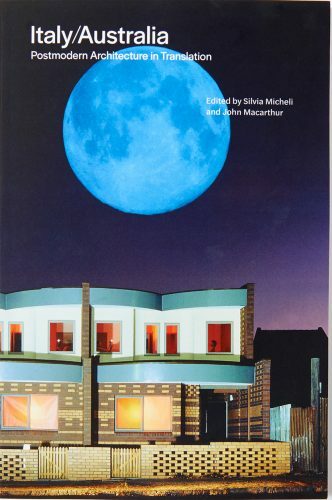 Dedicated to the memory of Romaldo Giurgola and completed by a poem by Enrico Taglietti, this book adds to the ongoing discourse on European influences on Australian culture and represents a collective attempt to initiate a first critical assessment of national postmodern architecture. Italy/Australia is illustrated by 50 colour photographs and drawings, including archival materials such as original sketches and plans for the 1979 Melbourne Landmark Ideas competition. Edited by Silvia Micheli, Lecturer at the University of Queensland, and John Macarthur FAHA, Professor of Architecture at the University of Queensland, Italy/Australia features contributions from the editors, Lea-Catherine Szacka, Philip Goad, Francesco Vitelli, Paul Walker, Karen Burns, Antony Moulis, Elizabeth Musgrave, Peter Kohane, Gevork Hartoonian, Ian McDougall, Rex Addison, Mauro Baracco, Conrad Hamann and Enrico Taglietti.